This DC-DC converter page has converters that we have designed as well as DC/DC converters that we import from our design partners in the Far East and Canada. 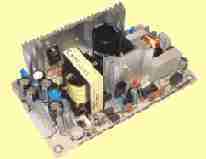 They are all efficient switchmode power supplies with regulated output. We have developed a series of DC-DC power supply designs ranging from 1 watt to 500 watts which we can incorporate into new DC-DC converters. We also develop new circuits whenever needed to meet our customer's requirements. We can also supply semi-custom products which are modifications for the products listed below, as well as fully custom DC-DC conversion products, including DC battery backup power supplies. For a list of PowerStream DC-DC converters arranged by input voltage please click here. Constant current buck converter with output range of 25mV to 32V, 5A maximum Inexpensive reducing voltage DC converter with constant current setting, output range 25mV to 32V, output current 10mA to 5A, set by multiturn trim pots. 48 Volt to 24 volt DC-DC Converter 150 watt isolated dc-dc converter for powering 24V devices in 48V telecom stations, forklifts, etc. 12 VDC Input ATX Style Computer Power Supplies Allows operation of an ATX style desktop computer from a car, boat, solar panel or motorhome. The input range is 9-18 volts. 6V to 12V regulating DC-DC Converters These DC-DC converters convert positive ground 6 (six) volt power in classic cars to 12 volts negative ground to use modern electronics. 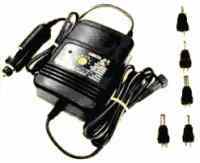 12 volt to 15, 18, 20 or 24 volt DC-DC Converter These DC to DC converter cords are designed to run or charge laptop computers from automobile power points (cigarette lighters). They come in 60 and 120 Watt converters. 12 volt to 12 volt regulating DC-DC Converters These DC-DC converter regulators are useful for giving stability to systems running off a 12 volt battery, either in an automotive or battery backup situations. Up to 700 Watts. Also available in higher output voltages (13.8 to 24 volts output), and in an adjustable model. High Current DC-DC Converter 48 V to 13.6 V This 204 watt switchmode voltage DC to DC reducer is used to power 12 volt equipment on forklifts and other industrial equipment. Input range is 40 to 65 volts, which covers 48 volt equipment and battery chargers. Custom DC-DC Converter We design and manufacture custom DC-DC converters for a variety of applications, specializing in high power (10 watt to 1000 watt) and unusual voltages, both isolated and non-isolated. 12 automotive converter dc dc project. 12 converter dc volt (voltage). Regulated voltage booster DC to DC Converter. Regulated voltage reducer DC to DC Converter. DC to DC voltage reducer. DC to DC voltage booster.